So, I planned that I would share the projects made at my classes and clubs this month with the idea that when I did so, everyone who attended would have already seen them. Well, a little Colorado snow and mostly ice storm put a little dent into this plan. My stamp club in Thornton didn't end up meeting as planned since it would have meant me driving through the said icy roads. So, gals for you this is ending up being a sneak peek or spoiler alert whichever way you want to look at it. 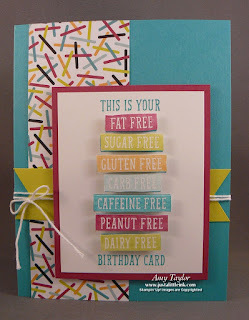 I need to mention that this card layout and idea came from a fellow demonstrator, Kelly Kent. Thanks, Kelly! First, I stamped the greeting onto a rectangle of Whisper White card stock using Bermuda Bay Ink. Then, I inked each of the 'labels' with the Stampin' Write markers and then stamped it onto a smaller piece of Whisper White card stock and then cutting each one out and popping them up with Mini Stampin' Dimensionals. 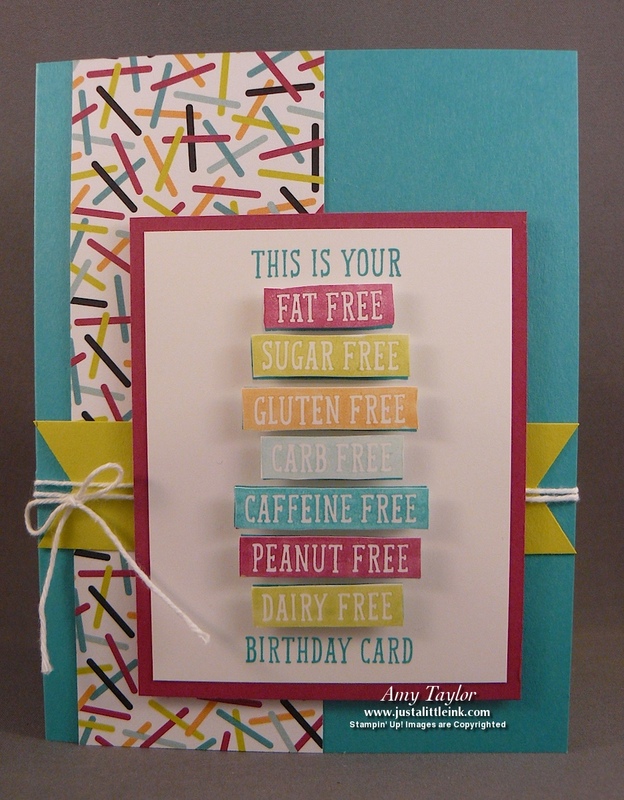 I liked the texture that it gave the card. You could certaintly just stamp once with the different colors for a quicker card!